Ida is no longer a hurricane as it loses strength over the water on its way to a landfall on the U.S. Gulf Coast sometime early Tuesday. The U.S. National Hurricane Center in Miami downgraded Ida to a tropical storm Monday morning after its top sustained winds dropped to near 70 mph. Hurricane warnings were dropped along the Gulf Coast and replaced with tropical storm warnings that stretch from Louisiana to the Florida Panhandle. The center of Ida was located about 185 miles south-southeast of the mouth of the Mississippi River and moving north-northwest near 17 mph. "Even though we're telling everybody to be prepared, my gut tells me it probably won't be that bad," said Steve Arndt, director of Bay Point Marina Co. in Panama City, Fla.
A hurricane warning had been extended from Pascagoula, Miss., east to Indian Pass, Fla. Tropical storm warnings and hurricane watches are in effect across other areas of southeastern Louisiana, Mississippi, Alabama and the Florida Panhandle, including New Orleans. Louisiana Gov. Bobby Jindal declared a state of emergency as a precaution, and the National Guard was on high alert if assistance was needed. Early Monday, Ida was located 285 miles south-southeast of the mouth of the Mississippi River and moving north-northwest near 16 mph. The latest forecast from the National Hurricane Center shows Ida brushing near Louisiana and Mississippi, then making landfall near Alabama before continuing across north Florida. Officials were encouraging residents to prepare for potential gusts of 60 mph by removing any tree limbs that could damage their homes and securing or bringing in any trash cans, grills, potted plants or patio furniture. Residents of Pensacola Beach and nearby Perdido Key were encouraged to leave, and school was canceled in the area Monday and Tuesday. Some schools around New Orleans also canceled classes for Monday. Nearly 1,400 Louisiana residents are still living in federally issued trailers and mobile homes after hurricanes Katrina and Rita; nearly 360 units remained in Mississippi. "FEMA stresses that those in temporary (housing) units should not take chances," Federal Emergency Management Agency spokesman Andrew Thomas said. "Leave the unit behind and evacuate to a permanent structure that will better withstand tropical weather systems and the associated winds." Mississippi authorities warned residents to be vigilant. Authorities were monitoring conditions to see whether any evacuations of lower-lying areas or school closures would be necessary. "It is likely we will at least be hit with strong winds and some flooding in our coastal counties," said Jeff Rent, a spokesman for the Mississippi Emergency Management Agency. Officials "do not want anybody to be caught off guard." Mississippi Emergency Management Agency Director Mike Womack said forecasts called for tides of 4-7 feet above normal and rainfall totals of 5-7 inches within 24 hours, which could mean flooding along the coasts and along rivers. Alabama emergency management officials did not immediately respond to phone messages. In the Florida Panhandle, residents in Bay County and Panama City were being advised to secure boats and prepare for storm surges that could reach 2-3 feet. Heavy rain, wind and possible flooding was also expected. "You really don't know until it gets close how you're going to be affected by it," said Brad Monroe, Bay County's deputy chief of emergency services. CBS "Early Show" weather anchor Dave Price reports that Escambia County, Florida, officials have encouraged people in low-lying areas to leave. "Conditions are going to deteriorate, winds are going to increase. The rains are going to begin, and we are really going to start to see tropical storm force winds," said Sonya Daniel, Escambia's public information manager. 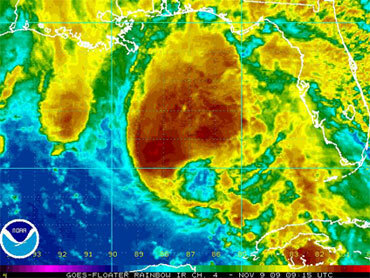 Ida wasn't expected to pack the wallop seen in 2008 when hurricanes Gustav and Ike pelted the Gulf Coast back-to-back. There have been nine named storms this season, which ends Dec. 1. Ida is only the third hurricane to form, and neither of the others threatened land. Ida wasn't expected to directly threaten New Orleans, where unflappable fans at the Saints football game seemed unaware a storm was approaching. "We're used to tropical storms," said David Clements of Chalmette, La. "That's why we have a dome." Earlier Sunday, Ida's wind and rain whipped palm trees in the Mexican resort city of Cancun. Fishermen tied their boats down, though tourists seemed to regard it as a minor setback. "It's not what we expected," said Kathleen Weisser, a nurse from Fernley, Nev. "We wanted sun. Instead we have liquid sunshine."